As a marketer, you understand how audio and visual elements can be combined to express your brand identity. But did you know that adding scent to that mix can encourage better recall of your brand? Essence of Lincoln is a signature scent developed exclusively for the Lincoln Motor Company by our Sensory Marketing agency, SensoryMax, and its partners. Dennis Carnevale, Lincoln's experience training manager, called the scent "a subtle, yet powerful tool for our dealers to use to help clients make an emotional connection to their store and the Lincoln brand." 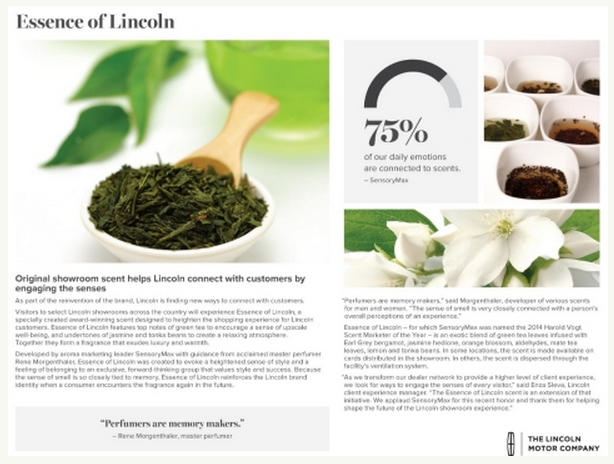 "Lincoln understands the unique power of Aroma Marketing," said Michael Seay, Director of SensoryMax. "They see its strength as a legitimate brand element; that it helps people form deeper connections and more memorable experiences with Lincoln." In an August 2014 press release, Lincoln explained that the scent was "designed to create an upscale, relaxing showroom experience" and that it "exudes luxury and warmth." The press release also mentions Pompano Lincoln in Pompano Beach, Florida. The dealership has been gently dispersing Essence of Lincoln through its showroom ventilation system for nearly a year, and customer reaction has been very positive. "We've gotten a lot of good feedback about it, both from customers and employees," said Tony Guerrera, general sales manager of Pompano Beach Lincoln. "It's a great scent. They really did an excellent job creating it."